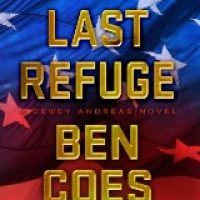 We’ve been talking this week about Ben Coes’ newest thriller, The Last Refuge. Today we have a special treat for those of you who are good listeners – an audio excerpt of The Last Refuge. Give it a listen and then tell your audiobook loving friends to buy a copy and support a great book! And don’t forget that we’re giving away a free hardcover edition signed by Ben Coes next Wednesday, July 11. Details are listed in our review and on our FB page.